We know very little of the early history of Inishmagrath or of the origin or derivation of the name of Inishmagrath. The ancient name of the area we now call the Parish of Inishmagrath was Muintir Chionaith, or Muintir Kenny. We know nothing more of this person called Cionaith, or of his family or clan. However, this part of Leitrim has been called after him and was known as Muintir Chionaith from early times. 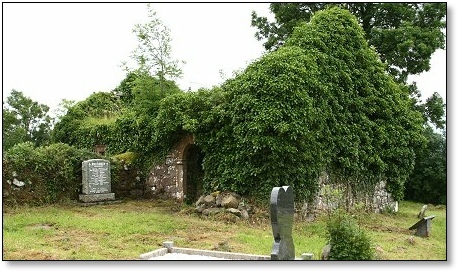 Historians are in general agreement that Muintir Chionaith and the parish of Inishmagrath refer to the same area of land on the northern and western side of Lough Allen. 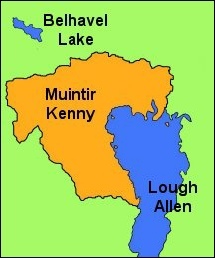 It seems that the parish derives its name from the Lough Allen island of the same name. The island consists of about seven acres and is situated a short distance from the shore, quite close to where the Shannon enters the lake. On it can be found the ruins of an old church and a disused graveyard. According to tradition this church was built by St Beo-Aodh, (St Hugh) who, according to tradition, was consecrated a bishop by St Patrick and who founded an abbey in Boyle, Co Roscommon. He died around 520. Over the centuries the island of Inishmagrath was used as a place of burial until a church was built at Kilbride in the 1730’s. This view of the island is from the Ballinaglera side. The new church at Kilbride had an adjoining cemetery and gradually replaced the island as the local place of burial. Why was the island called “Inishmagrath”? One possible explanation may lie in the fact that in medieval Ireland laymen were often appointed as hereditary wardens of churches and church lands with a duty to protect and maintain the church and its associated lands. Such people were called Termoners. One of the most prominent Termoner families in Ireland was that of McGrath. Could it be possible that the McGrath family were Termoners of the church and the island and that, as a result, the island became known as Inis McGrath (the island of McGrath) or Inishmagrath?